Bring the farmhouse, vintage look to your home with the Dakota Star Farmhouse Blue Ticking Stripe Fabric Euro Sham. Features washed blue and vintage white ticking stripes creating a classic, cottage atmosphere. Finished with ruffles on the edges. 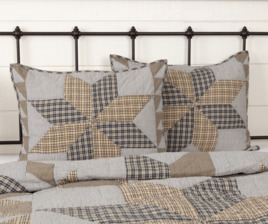 Add a classic farmhouse, vintage look with the Dakota Star Farmhouse Blue Sham. Features vintage colored patchwork with a unique star. 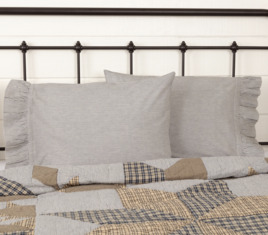 The classic star adds a country, rustic look to the quality, pure cotton Sham. The Dakota Star Farmhouse Blue Ticking Stripe Pillowcases bring a classic, farmhouse, vintage look to your space. They feature vintage colored ticking stripes and ruffle at the opening. 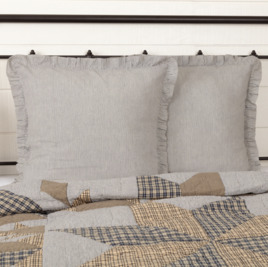 Ruffles add a country chic look to the quality, cotton pillow case.